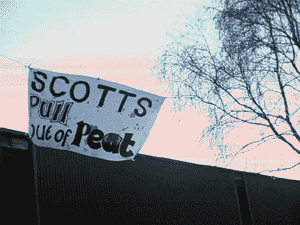 Monday 18th February 2002 - National Day of Action against Scotts. Across the UK offices, factories and peat extraction sites belonging to The Scotts Company (the world's largest horticultural company) were today occupied or disrupted by activists protesting against the continued destruction of rare raised peat bog habitats. Seven facilities belonging to Scotts were targeted by Peat Alert, a recently-formed national campaign network, which aims to stop peat extraction in the UK and Europe. "We want Scotts to know that they cannot continue decimating our wild places without attracting this type of disruptive opposition", said Danielle Locke, a spokesperson for the network. Godalming, Surrey - Head Office At around 2pm 20 people went into the offices for about an hour & a half before police with dogs arrived and people left. Most of the office was closed down and the front doors were locked using bicycle D-locks. There were only about 70 workers, so they made quite an impact. After leaving the demonstration a van load of protesters were pulled over. By around 5pm 15 people were arrested and taken to Guildford police station, charged with burglary. They were released at 3am the following morning, not charged but bailed to reappear on one of two dates in April. Corwen, North Wales - PBI Home & Garden fertilizer & pesticides manufacturing plant. "a fun day out had by all! Early this morning (well about 8 am) 13 welsh and english activists descended on Corwen home and garden plant in north wales - owned by Scotts - and proceeded to disrupt work at the factory. The office was occupied as was the factory floor. A banner was hung overlooking the A5 road. The gates were temporarily locked shut. Initially surprised workers were mainly friendly - even pleased to see us!- and had no love for "parent " company Scotts, who are rumoured to be about to sell off the plant leaving workers in the lurch. Several already knew about Scott's operations at Hatfield Moor. After a couple of hours' hanging around getting in the way, more police showed up (it took an hour 4 the first ones 2 get there despite the cop shop being literally 500 yards down the road!!) and it was leave or get nicked time. We left, leaving one pretty pissed- off manager who claimed to be missing a back- up computer disc. we then went for a scramble around the ruins of Llangollen castle...lovely. "actions- better than work!" "
Bramford, nr Ipswich, Suffolk A group of 15 activists arrived at Scotts Fertilizer plant at 9am. Unfortunately the security were just securing the site after being notified of another action in Corwen Wales two minutes before. Four people rushed into the offices and two were evicted very quickly. One managed to find his way into an office with a paper 'Scotts A Peat Strategy' on it but after barricading the front door, the person whose office it was entered through the back door. One managed to hide in an office and not get noticed, even when the police searched the building, unfortunately the only thing in there was archives. One group closed and D-locked themselves to the exit gate, and one group headed for the entrance gate, but couldn't lock it shut, so entered the lorry yard. After one person clung to the underneath of a lorry, most of the rest of the people were bundled out of the yard. The lorry driver and his mate tried to use force to remove the person clinging on and punched an activist who stood in their way. Outside the Entrance gate a lorry pulled up and was immediately D-locked to underneath, starting the tail back process which had up to twenty lorries in it with many more being turned away. The blockade lasted for 3 hours, it took them about an hour to boltcropp the activist from under the lorry free. The police then arrested five people for aggravated trespass or obstruction of the highway. Arriving at the site just after us was the director of the international fertilizer division, Eric von Karthoven, who had traveled over from Holland for a meeting. He was thoroughly grilled by campaign members. Hatfield Moors, South Yorkshire - Between 11.30 and 12.30, 15 activists arrived at Hatfield Moor, and spent the day carrying out conservation work on the moor, including filling in drainage ditches to prevent the moors drying out. There were no police, so they just got on with it and left the moor around 5.00. They then proceeded round to the front gates and stopped work in the factory for about half an hour, leaving before the police turned up because they were knackered. Wedholme Flow, Cumbria. About 10 people spent the day on the site of Scotts peat mine in Cumbria. There wasn't much work going on to disrupt, so they decided that time was best spent building dams to interfere with Scotts attempt to drain the land ready for harvesting peat in the spring. Goole, East Yorkshire - At around 11.30 two women entered the offices of the Scotts fertilizer & pesticide manufacturing facility, staying only to send a fax to Nick Kirkbride, UK Managing Director at the Head Office in Godalming, announcing their presence and opposition to Scotts involvement in peat extraction. At the same time a set of gates were locked shut by other activists. Text of the fax: Dear Nick By now you will know that sites across the country are being targeted for demonstrations. This is because of Scotts' involvement (or should that be "championing") of peat extraction from rare raised bog habitats, in the UK and globally. You will have been aware of the enormous opposition to this practice when you bought up the peat facilities. You have been involved in negotiations around "Special Area of Conservation" status for Thorne, Hatfield and Wedholme Flow & others, and have slowed them down at every stage. You know you will be forced to stop sooner or later, so GO PEAT-FREE NOW, while you can still save a shred of reputation and there remains a chance to save the moors.